On a totalally different level. I just looked into getting some literature on Bowies...…...There was a book published by Flayderman titled the 'Bowie Knife', the going price on Amazon and other sites is well over $200 used and $400 new. Has any other knife style been as reproduced and romanticized as the bowie, (excepting some movie fantasy knives/swords)? You are correct......butcher knife profile, not chef knife......I mis-typed. I went back and edited my post. The flayderman book is good. I've had a chance to flip through it a few times. Price is in line with what I've seen. I just got "A Sure Defense: The Bowie Knife In America" book for Christmas from my wife. Equally good with much of the same content and more affordable.....around $75 I think? you know how to contact Marty McFly? when you talk to him give him my number... I 've some things that I want to talk about. HA! Me to! I think I'll start with lottery numbers and a few choice stocks. I'll have to check that out John! What a thoughtful Christmas present from your wife! That thing is looking good OP...Where is the Hamon? Not quite there yet! Thanks! Here's a good link for history of the Bowie that shows just how varied the "Original" Bowie knives where. Here is an interesting paper on origins of the Bowie and James Black's part in the Bowie. I hope this link works, it's a PDF file to download. Here ya go. Hollywood at it's best. that knife look excellent OP. Here is one more for you to spend your time reading. Probably the same but different. Great article. Thanks for sharing. FYI. The front story in this months Blade magazine is about Bowie’s knife. Thanks Op. I'll take a look. I couldn't maintain the flats from the initial grind and in trying pretty much destroyed that blade. So, I started another one and did a flat grind. Here is where I am so far on this blade. I have a nickel guard and pin with the stag handle. 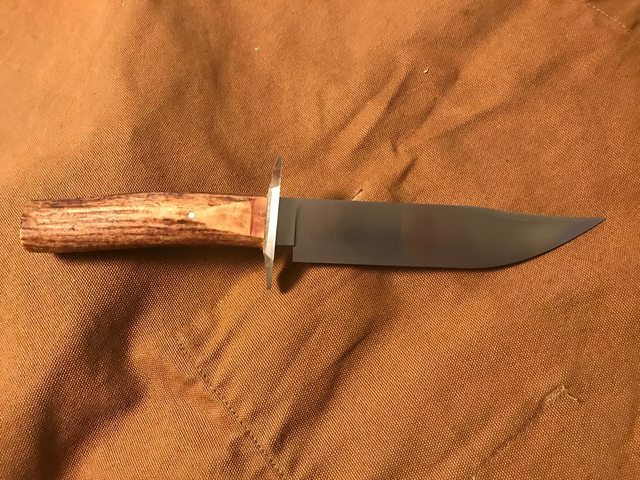 This knife is 13" OAL with a 7-3/4" blade. I really did mess the first one up. I got in a hurry and let the grind get away from me. I was really disappointed as the initial grind was spot on for me. This one is a little larger and coming along nicely. I’m beginning to like working with antlers.